Officers and troopers were kept busy in Pinellas County on Wednesday as they clocked people on US 19 and the Courtney Campbell Causeway, then handed out tickets. 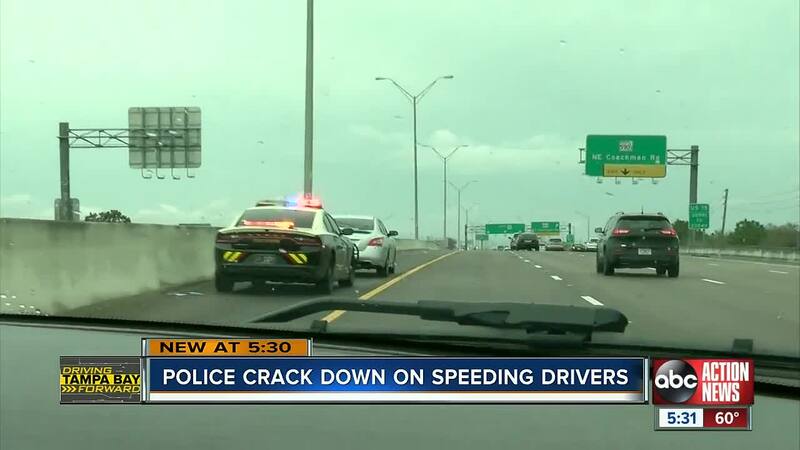 PINELLAS COUNTY, Fla. — Officers and troopers kept busy in Pinellas County on Wednesday as they clocked people on US 19 and the Courtney Campbell Causeway, then handed out tickets. "Doing 60 in a 35, that’s not good,” said Officer Dan Negersmith, with the Clearwater Police Department. "It can get really hairy out here," Officer Negersmith continued. Negersmith works these streets every night and says they are hot spots for high speed. "We’re catching people on 19 doing over 100 miles an hour,” he said. Rain and slippery roads seemed to hinder speeds for some, but not all. "They were doing 75,” said Negersmith, as he pulled over a car on the Courtney Campbell. The Clearwater Police Department says they handed out 80 speeding tickets and 64 warnings. But, the detail proved to catch more than just speeders. "They have no registration or proof of insurance on the vehicle,” Negersmith said. No drivers license either. Officers found a gun in another car. They made 4 arrests Wednesday, and gave out at least 24 tickets to people who didn't move over. They see people ignoring the move over law and blowing past them a lot out here. "I don’t stand a chance against a 3000 pound bullet that’s coming at me. And if somebody hits me, I’m not gonna live,” he said. It’s why Negersmith says these traffic details are an important reminder for folks to slow down and move over.